Chinook salmon have been the bread and butter of Lake Michigan’s sport fishing industry for nearly 50 years, but the popular fishery now faces many of the same threats that wiped out Lake Huron’s salmon fishery a decade ago. The similarities between Lake Michigan’s salmon fishery and the Lake Huron salmon fishery in 2003 — the year before it crashed — are striking. One of the most alarming parallels: Lake Michigan anglers caught fewer Chinook salmon this year but the fish were much larger than in recent years, despite a dwindling supply of fish food in the lake, according to charter boat captains and state officials. That mirrored conditions in Lake Huron in 2003, the last good year of salmon fishing there. A combination of invasive mussels disrupting Lake Huron’s food chain, too few alewives (the primary food source for Chinook salmon) in the lake, and too many salmon resulted in the Chinook population eating its way into oblivion. Walsh experienced a similar scenario a decade ago, when he was running salmon fishing charters on Lake Huron. “In 2003, I was getting limit catches and the next year I caught six salmon all season,” he said. Denny Grinold, who has run a charter boat on Lake Michigan for more than 30 years and is one of the region’s most respected leaders in the fishing community, said anglers are concerned about the future of Chinook salmon fishery. 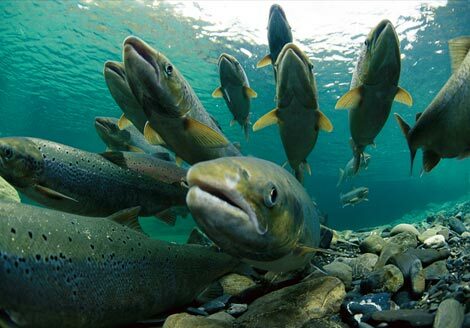 Michigan and the other states surrounding Lake Michigan have dramatically reduced the number of salmon stocked in the lake in recent years in an effort to prevent the Chinook from eating all the alewife, and then suffering a population collapse. • Zebra and quagga mussels that invaded the Great Lakes in the 1980s now consume vast amounts of nutrients at the base of the food chain in lakes Michigan and Huron, leaving much less food for the non-native alewife and other bait fish. • Chinook salmon, an introduced species, are eating alewives in Lake Michigan faster than the baitfish can replenish its population. The result: Fewer alewives in the lake, and the fish are younger and smaller. In a good year, scientists would find as many as eight different year classes of alewives in Lake Michigan, or fish ranging in age from 1-year-old to 8-years-old. Last year, researchers found just four different year classes of alewives, and 80 percent of those were 2-year-old fish, said Todd Kalish, acting Lake Michigan basin coordinator for the Michigan Department of Natural Resources. That finding suggested that Chinooks are wiping out the older alewives and are now eating their way through groups of younger fish. Barring a change, the phenomenon could be a recipe for a population crash — for alewives and salmon that depend on them for sustenance. The shift in Lake Michigan’s salmon catch from 2012 to 2013 points to biological instability in the lake, said Dan O’Keefe, a Michigan Sea Grant educator who studies fisheries. Grinold said it’s important to remember that Lake Michigan’s salmon fishery is still world-class, despite problems with invasive mussels and a dwindling supply of fish food. He said the number of Chinook caught in Lake Michigan per hour of angler effort remains one of the world’s highest. It’s also important to note that Chinook salmon isn’t the only species of sport fish in Lake Michigan. Anglers routinely catch Coho salmon, steelhead, brown trout and lake trout. Some anglers have said they hope the alewife and salmon populations crash, so that native fish species could play a more prominent role in the Lake Michigan fishery. But Chinook salmon remain the number one attraction for most Lake Michigan anglers. There’s a reason the fish are nicknamed “Kings” — they are the biggest, strongest salmon in the lake and put up a terrific fight when hooked. Tens of thousands of anglers take charter-fishing trips on Lake Michigan every summer, which generates millions of dollars for coastal communities. In Grand Haven alone, 7,640 anglers booked charter-fishing trips in 2012, according to state data. The plight of Chinook salmon in Lake Michigan is more than a fish story. A sagging salmon fishery would hurt tourism-dependent communities up and down the coast. The collapse of Lake Huron’s Chinook salmon fishery sent a shockwave of economic pain through the region’s coastal communities — many anglers sold their boats and numerous marinas, gas stations, bars and restaurants that catered to anglers went out of business. Fishing pressure on Lake Huron dropped by 75 percent after the Chinook salmon vanished, which translated into a $19 million loss of economic activity in port communities, according to state records. Still, all was not lost in Lake Huron. Walleye, lake trout and other native fish species have staged dramatic recoveries in the absence of Chinook salmon, and Saginaw Bay now has one of the world’s best walleye fisheries, according to state officials and veteran anglers. “The walleye fishing is off the charts, but they don’t generate the fishing activity that salmon did,” Walsh said. Salmon fishing is an integral part of West Michigan’s tourism industry. Grand Haven, which is home to one of the busiest charter fishing ports on Lake Michigan, has hosted a Salmon Festival every September since 2004. The festival attracts thousands of people and generated more than $600,000 in economic impact in 2009 alone, according to a Michigan Sea Grant study. “The focus of the festival is to celebrate the fall migration of the salmon and to bring attention to the importance of our natural resources,” said Marci Cisneros, the festival’s director and executive director of the Grand Haven Area Convention and Visitors Bureau. Grinold said many of his charter fishing customers return year after year, and gladly spend hundreds of dollars, even if they don’t catch salmon. Did you know what alewives eat? Alewives eat the same zooplankton that all fish need and we don't want the Asian Carp to eat! They fail to mention this. Alewives alone can wipe out all the zooplankton in Lake Michigan in a matter of days, with or with out zebra/quagga mussels etc... Documented fact. please find (Zooplanktivory by Alewives in Lake Michigan) read for your self. Alewives also larval native fish also like we don't want asian carp to eat. They are not "balancing the prey" the DNR is trying to fill lake Michigan back up with alewives. Alewives only benefit one fish chinook, it takes 123 pounds of alewives PER chinook to hit 17 pounds in 3 years, It takes 4 pounds of zooplankton PER alewife to hit 1/10 tenth of a pound. See the problem, we have to sacrifice the entire natural resource for one non-native fish? Alewives main diet is zooplankton plain fact, we don't need more invasive species, we have too meny now! Tom, what is your problem? Chinook salmon are the best eating salmonid we have in Lake MI. I suppose you'd rather eat toxin laden lake trout? No thank you. BTW, if alewive can wipe out the zooplankton in days, why hasn't it happened in all these years? You throw out lots of numbers, too bad they're worthless. Sorry pal they have. Algae blooms in the 60's tied to alewives. Dead fish ducks and birds tied to alewives botulism. Native fish not surving the spawn tied to alewives, happening now. Alewives main diet is zooplankton, followed by larval native fish, plain fact. Salmon are in the top 3 worst for retaining PCB next carp and catfish. Look it up all documented stuff. What does how they taste have to do with anything? Salmon taste better than Perch? Good luck with that one. We have a massive invasive species problem, costing billions of dollars a year affecting several states and inland lakes, filling the lakes back up with alewives is just compounding the problem, whether salmon taste good or not. We have 188 invasive species, chinook only eat one! Invasives win, proofs in the lake. Chinook is the only fish dependant on alewives to survive, no other fish. Perch eat pretty much all the invasive species we have now including the mussels and retain the least amount of PCB of any fish in the Great lakes. (low fat content) sorry pal. All I want to do is stock/restore the native Perch, but Perch are banned from stocking in Lake Michigan, but you it seems you can plant any saltwater fish you want and protect an invasive species. Alewives. Many times more people would and can afford to go fishing for Perch than salmon. Perch would also reduce invasive species population, salmon do not. The one thing this story failed to mention is that September and October catches of salmon (younger ones, not the spawners) were excellent, better than the summer fishing, and they were of good size/shape (3-13 pounds, with occasional mid- to upper teens fish) and most had bait in the bellies. Many Wisconsin charters reported catches of 10-20 salmon in September and October, with occasional 20+ catches. Additionally, the river runs mid-Sept. to early October were very strong, better than 2012 when the summer fishing was much better. So where were all these fish in '13? It's a big lake! Deeper in the water column or further off shore than most were fishing, is what many believe. We'll see what happens in '14. Meanwhile, Tom M. is allowed his opinions. If you follow him across the internet, you'll see he believes that simply stocking perch and other "predators" of invasives will save the fishery when in fact it's quagga mussels that are driving the decline of food at the lower end of the chain and the majority of them live in water far deeper than perch and other predators roam. Thank you MDNR and WDNR for stocking salmon. Long live the king! Scoopy! Sorry experts say the mussels can be controlled by predators I'm with them. How deep the mussels are don't mean spit, not the point. We have billions of invasive species, the best plan we got is to restore alewives? That eat the same zooplankton whether mussels there or not, alewives also eat native lrval fish with or with out mussels, have since they got here. Alewives are down but gobies, invasive white Perch and spiny fleas filling that hole in behind them. Perch are predator and prey, take the energy trapped by the mussels by eating them and pass it on to the top predators. Alewives eat the same zooplankton we don't want asian carp to eat. So filling the lake back up with alewives is ridiculous. Tom, how deep the mussels are certainly does mean a lot, since perch won't have access to a MAJORITY of them thus are useless in helping. Check this out: http://www.livescience.com/8592-destruction-giant-algae-doughnut-threate.... "All the energy in the phytoplankton, which once fed fish, is now being sucked down to the bottom of the lake by quaggas. " Scoopy, filling the lake back up with alewives just compounds are already massive (expensive) invasive species problem we have now. Every invasive species including the mussels that a perch eats is 100% controlled. The top asian carp expert says asian carp can be controlled with predators, most native predators fit the bill, but they eat alewives. So tell these nice people the truth, that all you care about is catching salmon even if it destroys the entire natural ecosystem resource. Tom, your own ignorance on this issue is shining like the brightest LED bulbs on the planet. I love to catch salmon, perch, walleye, smallmouth, largemouth, bluegills, crappies, sunfish, muskies, pike, trout, catfish and more ... and we have them all in Lake Michigan and its fish-filled bays. YOU CAN'T CONTROL LAKE MICHIGAN'S QUAGGAS WITH PERCH OR ANY OTHER PREDATOR. END OF STORY. Do not judge the Lake Trout of yesterday that's diet consisted of alewives. Today, the Lake trout are packed full of Gobies and they are way better table fare than you would expect! My daughter's boyfriend brought me a big bag of lake trout fillets home from a chartered trip last summer in Charlevoix. I was expecting the "Greasers" that I attempted to eat back in the 80's-90's. Not at all! The fillets were pink and were excellent on the grill. Granted, these fish were 4-8 pound fish, not the 12-20 pounders. That's no different than trying to eat an 8 pound walleye. They are not the same fish.